There are plenty of reasons to root an Android device (e.g., OS updates, de-skinning, getting rid of bloatware, customization). But it can be a scary path to travel if you have no clue what you’re doing. Especially if you want to return your phone back to the way it was when you bought it. 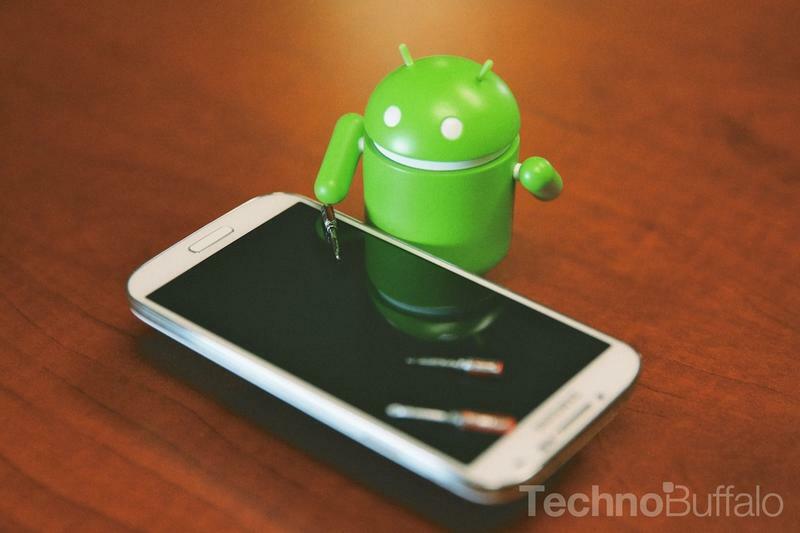 Below, we’ve outlined how to delete your root as well as put your phone back to stock factory firmware. You must do this tutorial on a Windows XP/Vista/7/8 PC. This WILL erase everything on your phone, so make a backup! Ensure the battery of the phone is charged to more than 50%. 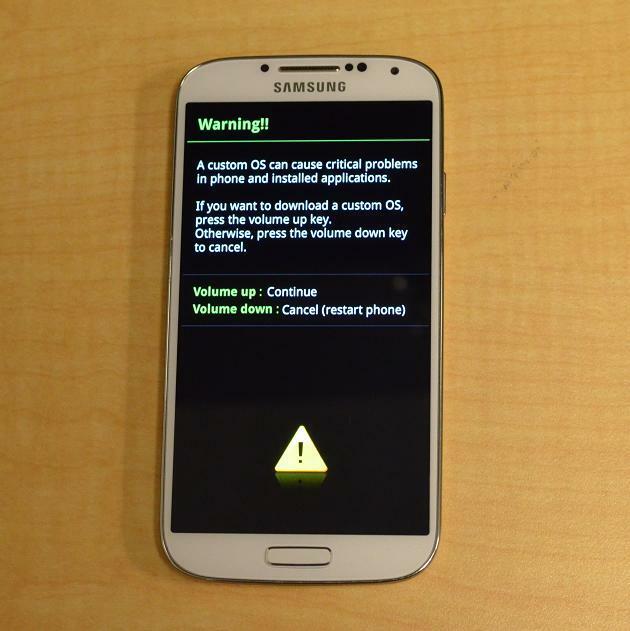 The stock firmware download below is ONLY for the Galaxy S4 I9505 model. If you are using a different device, please search for your phone’s specific file before continuing with this tutorial. Plug your phone into your computer and make sure all drivers are installed properly. Put your phone into “Download Mode” by restarting and holding in the Power and Volume Down buttons. Click Volume Up when you see this screen. Right click on Odin.exe and click on “Run as Administrator”. Make sure a yellow box shows up, if it doesn’t then try using a different USB port or cable. Click on PDA and then search for the stock firmware you downloaded earlier. Click on Start and let the process finish. If you get a green “PASS” then it worked properly. Restart the phone and put it into recovery mode by holding the Volume Up button while it’s booting up. Go down to “Wipe Cache Partition” and click the Power Button. When that finishes go to “Wipe Data/Factory Reset” and click the Power Button. You must re-root your phone to do this. Follow the previous tutorial on how to root your phone. After you are rooted, download Triangle Away from the developer’s website. 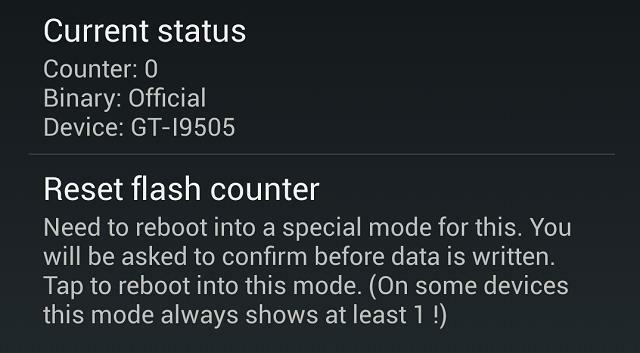 Click on “Reset Flash Counter” and then follow the instructions to complete the resetting process. To unroot, just click on SuperSU, click on Settings, and click on “Full Unroot”.